Well, we hate to say we told you so but Greenpeace’s tongue-lashing of Tesco’s introduction of a new tuna label with a predictable supply and a price tag the average UK family can afford should come as no surprise. 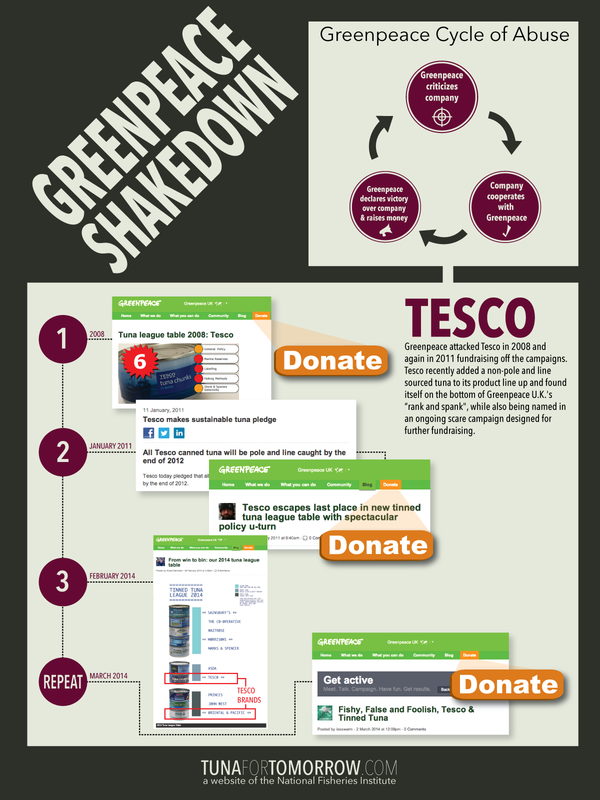 Three years after many UK retailers decided it was better to commit to an unsustainable and unpredictable pole and line tuna product than challenge Greenpeace’s sustainability accusations, Tesco is feeling the heat from a new public relations campaign from the green monster with even harsher hostility. We don’t like to see Tesco in this situation. But not only was the latest “rank and spank” of Tesco predictable, it serves as a cautionary tale to American retailers that there is no appeasing Greenpeace. Greenpeace makes demands, retailers acquiesce only to find themselves in the PR spotlight they sought to avoid when Greenpeace claims they can’t keep their promises or worse yet, meet new Greenpeace’s demands because what they did before is no longer enough. We have a name for this pattern-the Greenpeace Cycle of Abuse. 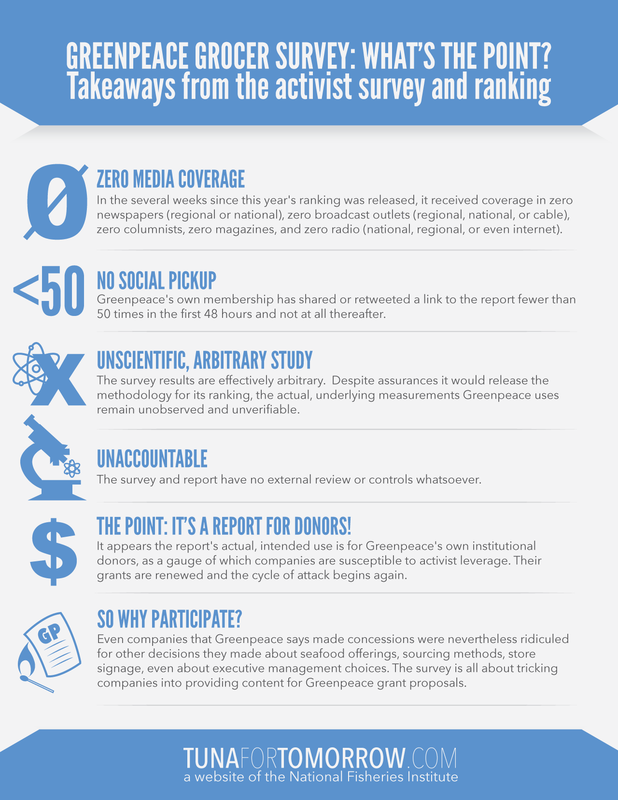 In simple terms, Greenpeace makes demands, the retailer cooperates and then Greenpeace turns around and asks for more. Greenpeace’s lofty goal is to “ensure the ability of the earth to nurture life in all its diversity.” But as the group’s own “core values” note, “What matters isn’t words, but actions,” and, they claim “there’s only one standard in this: The environment has to benefit.” But Greenpeace’s juvenile and unserious actions regularly fail to live up to their own high-minded standards. 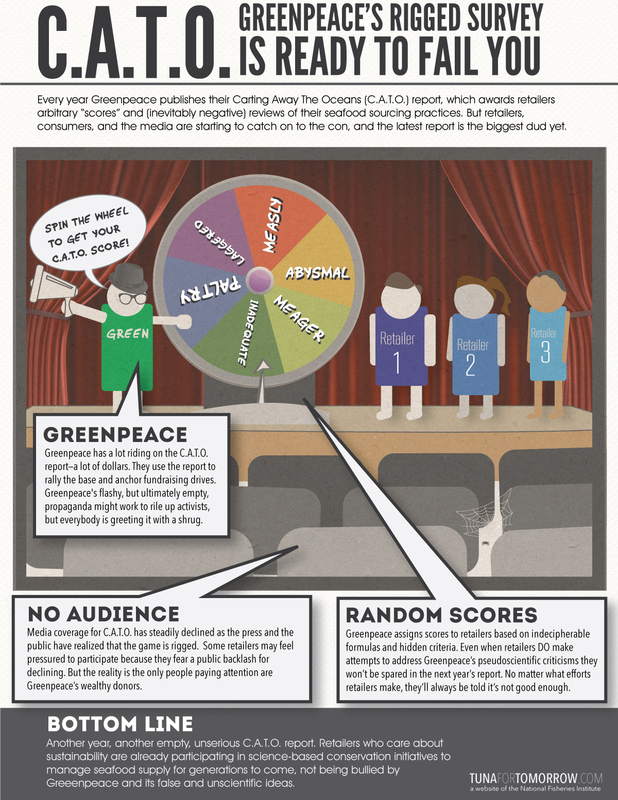 1) Greenpeace denounces seafood certifications, fishery improvement projects and the work of any other ENGOs. …at board meetings chaired by a dancing dude in a sombrero and cardigan. 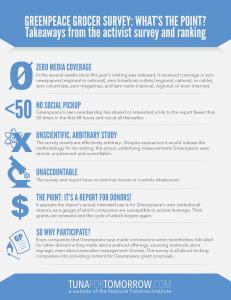 Greenpeace Grocer Survey: What’s The Point? 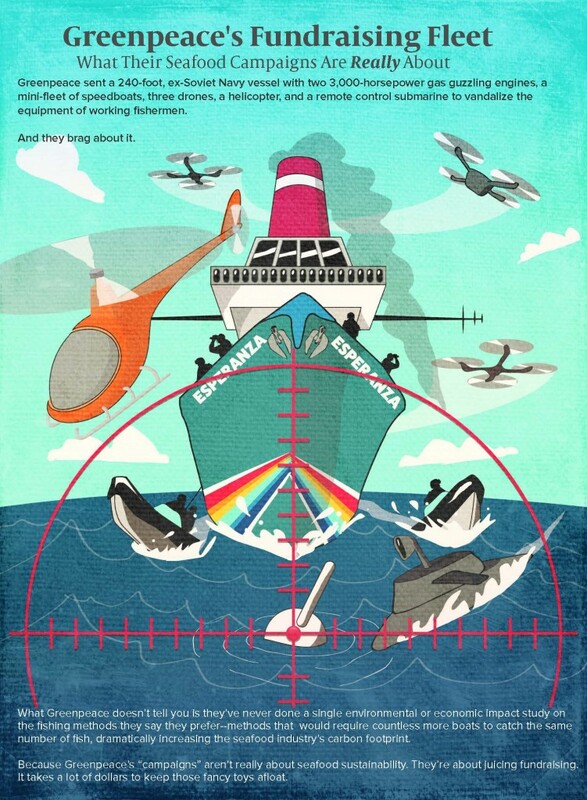 In all of their campaigns, Greenpeace activists expect companies to trust their stated objectives, believe their evidence and implement their extensive demands. There’s just one major problem: Greenpeace has no credibility to influence — let alone inject itself in — serious discussions about environmental and health issues. Long ago, they disqualified themselves from the ranks of serious conservationists, scientists, and researchers by resorting to immature, violent and counterproductive tactics. Greenpeace activists may be able to boast about picketing in plushy costumes, vandalizing buildings, trespassing private property, creating meaningless online games, and placing harassing phone calls, but they sure don’t have science, reason and authority on their side. But that’s their modus operandi. They target high profile companies, bully them in accepting unrealistic demands, fundraise off of the so-called “victory” … and then harass them some more. No one wins except Greenpeace. Why? Because their ultimatums, stuns and protests never improve the issue in question — like seafood sustainability — only Greenpeace’s bottom line. Greenpeace activists say that all tuna should be caught one at a time with poles and lines. But catching tuna is not that simple. 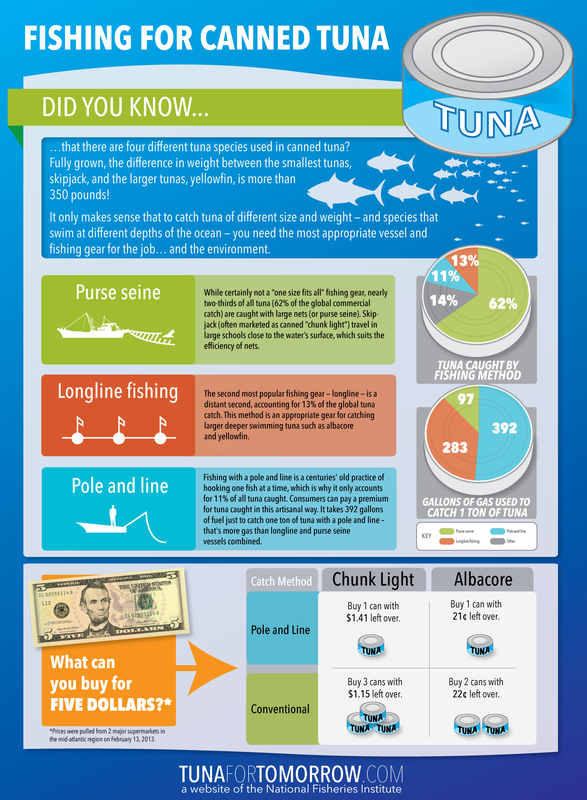 The fact is, four different kinds of tuna species make up canned tuna, each one varying in size, weight and habitat. Likewise, fishing gears have different capabilities — and tradeoffs such as fuel usage. 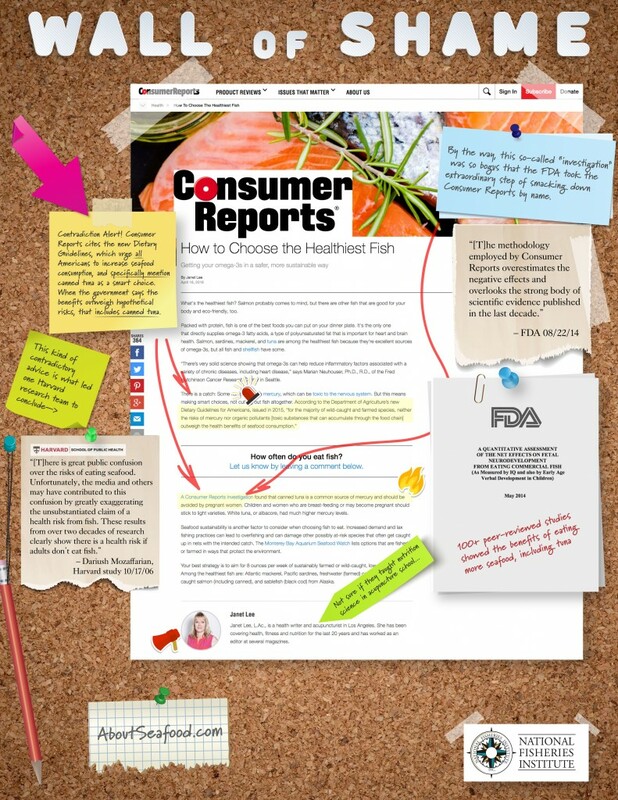 These factors must be considered in order to minimize costs to the environment and impact on consumers’ wallets, as well as maximize efficiency. Unlike Greenpeace campaigners, who make demands without considering scientific facts and the consequences of their ideas, the tuna industry has heavily invested in the International Seafood Sustainability Foundation (ISSF) to find the most advanced, sound ways to fish tuna and ensure healthy stocks. We’ve seen how Greenpeace has used a predictable formula of attack, declare victory, and attack again to raise money for its operations. 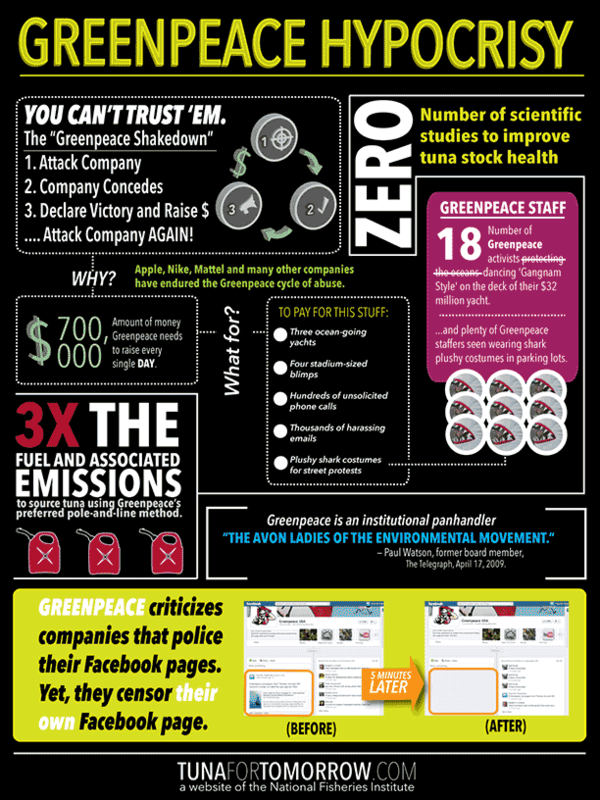 In some cases, Greenpeace will falsify data in order to pressure target companies. Case in point, Mattel. In 2011, Greenpeace waged a fierce campaign against the toy-maker for supposedly using endangered wood from rainforests in its packaging. In the course of its campaign Greenpeace hijacked the company’s iconic Barbie and Ken doll figures and repurposed them in disturbing ways to harm Mattel’s reputation. Greenpeace even went so far as to claim they had independent research to back up public allegations that US toy companies were using unsustainable packaging sources. They had no such data. But no matter. 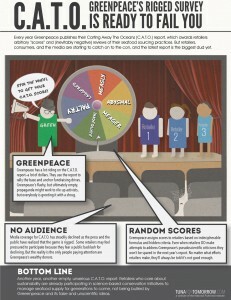 Greenpeace simply lied about data they did not have and used the study and other harassments to create an intolerable distraction for the company. When Mattel later announced it would review its paper sourcing policies, Greenpeace declared victory and appealed for money from its supporters. 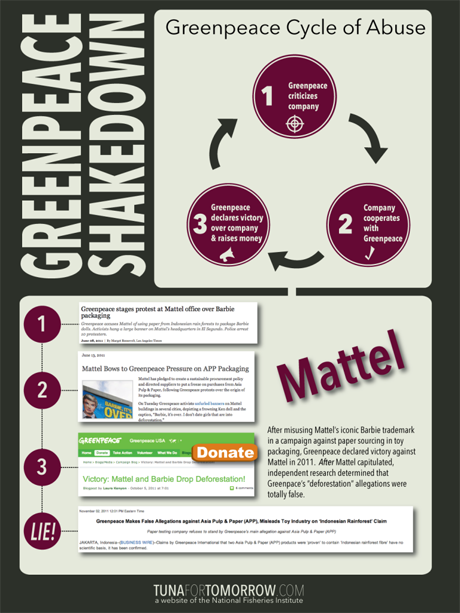 As for Mattel, it is only a matter of time before Greenpeace attacks them again. Because once Greenpeace has extracted concessions from a company they will be sure to try to do it again and again. PS. What do they do with all that money? Click here to see for yourself.